Frittatas are a lifesaver. Not only are they delicious, but they also swoop in to save the day (or at least dinner) when I have no proteins capable of being cooked into a main course. As long as I have enough eggs on hand and a variety of vegetables, a frittata is the way to go. Frittatas are basically large, thick omelets that are fun to make, fun to eat, and can include an infinite variety of fillings. The first step in making a frittata is deciding what fillings you want to include. I chose eggplant, onions, and broccoli. Zucchini, carrots, bacon, or mushrooms would all be delicious options too. You should cook your vegetables before starting the frittata because the eggs cook relatively quickly and you don’t want to end up with a crispy veggie frittata. 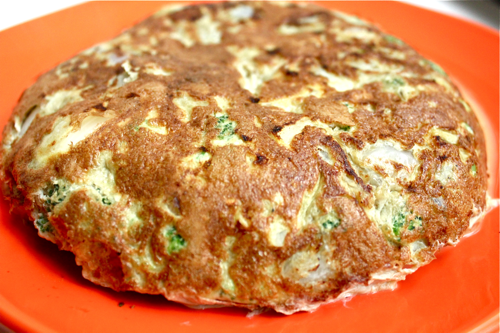 You should have at least 2 eggs per serving in your frittata, but 3 doesn’t hurt either! Whisk your eggs, and season them with salt and pepper. 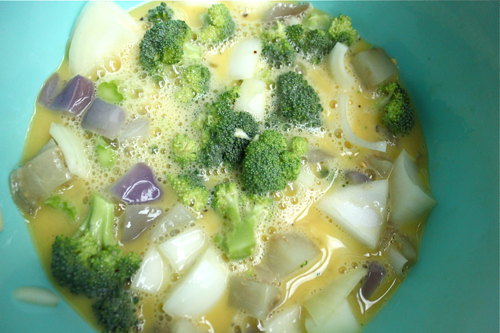 You can mix pre-cooked vegetables into your whisked eggs, or you can brown the veggies in a frying pan and add your eggs to them. Choose a frying pan that will allow your frittata to be about an inch thick, and coat it with nonstick spray. Let the eggs and veggies cook in the pan over medium heat, without stirring them, until the edges of the eggs are cooked and firm. The top of the eggs will still be watery. Now comes the exciting part! Place a plate face down on the top of your pan, and place your palm on top of the plate. Flip the frying pan and the plate over together so the frittata drops top down onto the plate. Add more nonstick spray to your pan and slide the frittata back in with the uncooked side on the bottom. 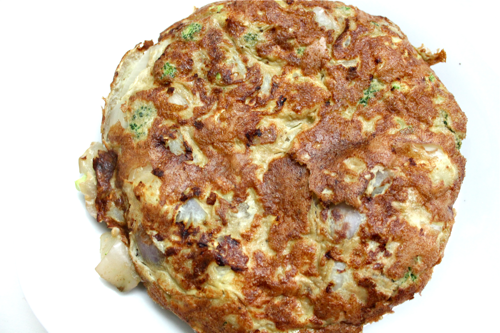 Your frittata is fully cooked when a skewer or fork stuck into the center of the eggs comes out dry. 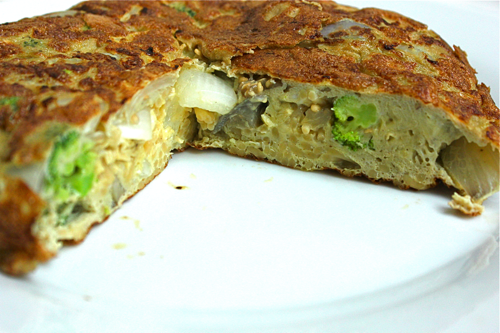 Slide the frittata onto a side plate and serve! I love how the eggs turn golden brown but have specks of color from the veggies. I also think it’s pretty cool to look at a cross section of the frittata to see how the different veggies are layered inside. 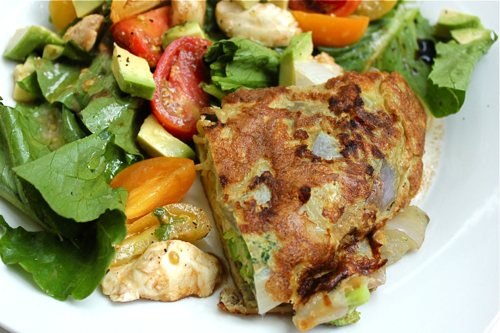 Serve your frittata with a salad and enjoy your healthy, filling, minimum-preparation dinner! Here’s a better way. Assuming most will have an old iron skillet, have it ready…oiled and Spamed. In the separate frying pan do the veggies until soft and if you have meat, get that ready as well. Eggs, lot’s of them with milk or a bit of half and half, whisked smooth with S and P. Into the hot skillet pour in the egg mixture, watching as the edges brown and begin to turn away from the sides a bit and then adding the veggies, etc. evenly. Assuring that the egg mixture is sealed bottom and sides and while the eggs are still a bit watery on top, layer in your cheese on top. For me, a great Frittata you need to have a great cheese. Then, after preheating the oven to about 375, insert the skillet and watch as it is finished off and then turn on to broil for a minute or two for browning. Let is sit for a few minutes after taking it out and you’ll be able to cut and slice like it’s a pie or cake. It never sticks and is wonderful.